This fantastic 5 oz. Silver Coin features the world famous Disney cartoon character: Mickey Mouse! 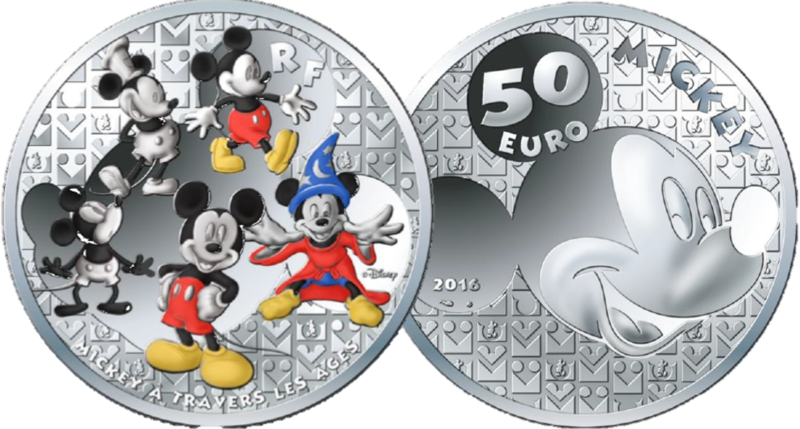 Crafted by the French national mint, The Monnaie de Paris, to mark the 50th anniversary of Walt Disney's passing in 2016, this Silver Proof coin is a true commemoration to Walt Disney's most iconic creation. Disney has helped teach children about some of the hard life truths while still managing to keep the overall atmosphere uplifting and entertaining. In all that they do, Disney always manages to find two levels of entertainment, to engage with both the younger and the older audiences. This silver coin is sure to be treasured, not just by coin collectors, but by Disney fans young and old alike. It shows us Mickey through the ages, from the very first original Disney drawings from Plane Crazy in 1928 to modern-day Mickey. The early characters including Steamboat Willie are depicted in "black and white" whilst the more modern renderings show Mickey from when he first appeared in colour, including, of course, the iconic Mickey from Fantasia. The reverse of the silver coin shows Mickey's portrait as we know it today. Since Mickey's first appearance nearly 90 years ago he has become a figure that is recognised and loved throughout the world, and this coin is already proving hugely popular amongst collectors. This official Disney 5oz Silver Coin has a limited mintage of only 500 pieces worldwide, and has already sold out at the issuing mint!